I'm loving how much more aware Ethan is of everything at the moment and he's literally into everything. He seems to know so much and is so capable, asking questions about lots of things and determined to give things a go himself. 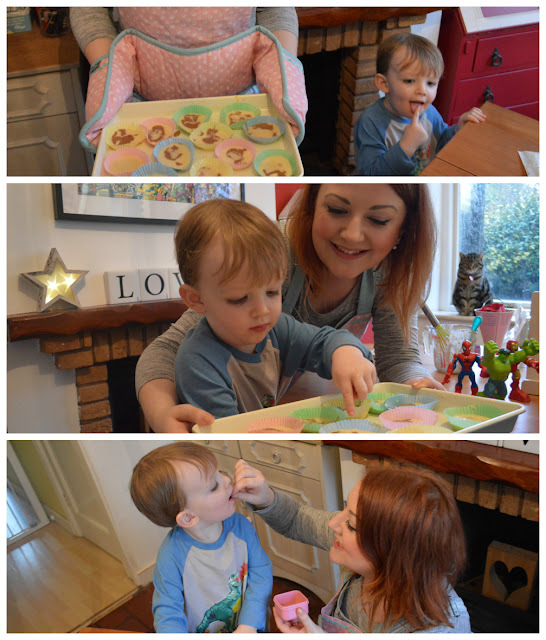 His nursery do so many activities with him during the week and I've been keen to try and do more things together. And baking was one thing I couldn't wait to try. Our kitchen is quite small, so even with just Ethan by my side, there wouldn't be a lot of room to move around so, at the weekend, we put the dining table in the middle of the room so we could have plenty of space to make something together. 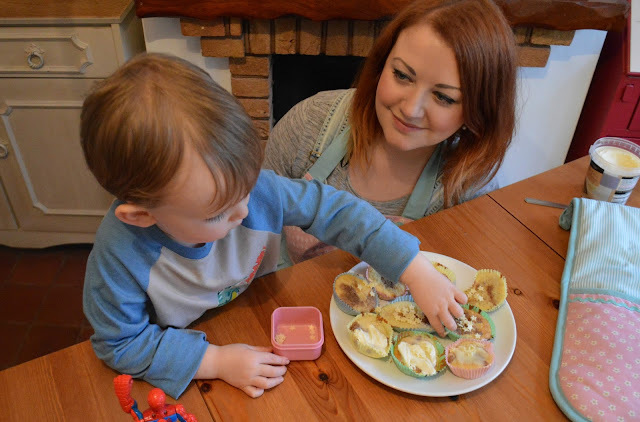 I'm not sure whether Ethan was making some cakes for mummy (good practice for Mother's Day next month!) 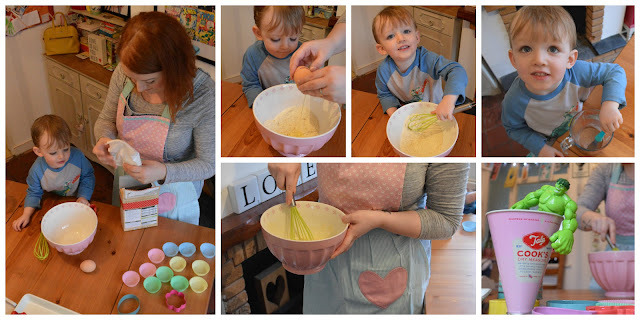 or if I was making cakes for Ethan, but we managed to whip up a batch quickly and without too much mess. Not that it would have bothered me - it's meant to get a bit messy, isn't it? 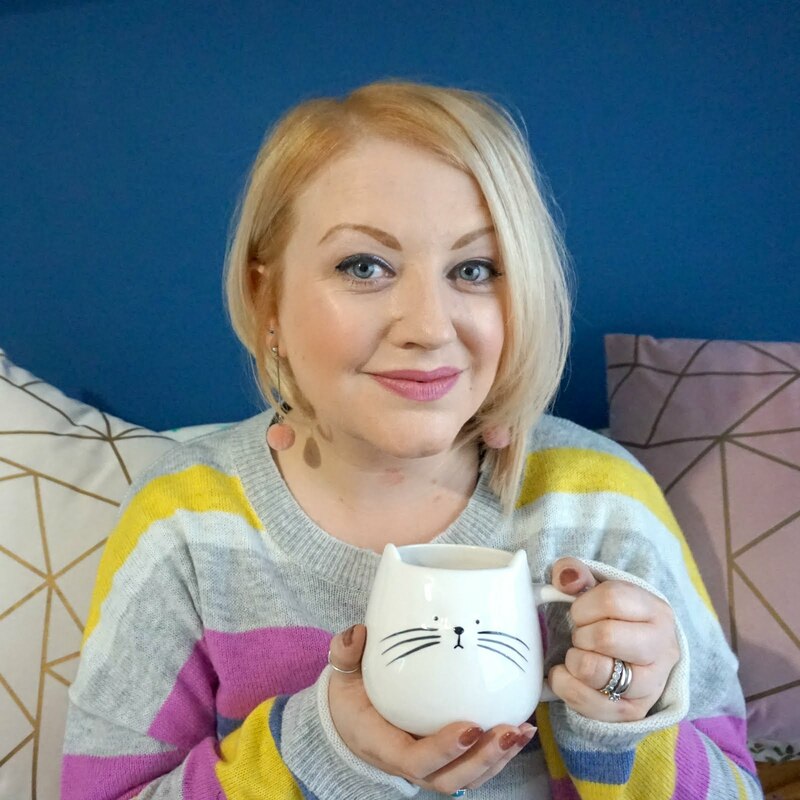 It also gave me the chance to try out some new lovely things I got from Debenhams. They have a huge cooking and baking selection and I quickly fell in love with the At Home with Ashley Thomas collection. It's got a vintage, feminine feel and honestly, I could have chosen the whole lot! Instead, I had to get this pinny and matching oven glove, as it's got a 50's housewife vibe and is just simply too cute. Perfect for baking with my buddy. 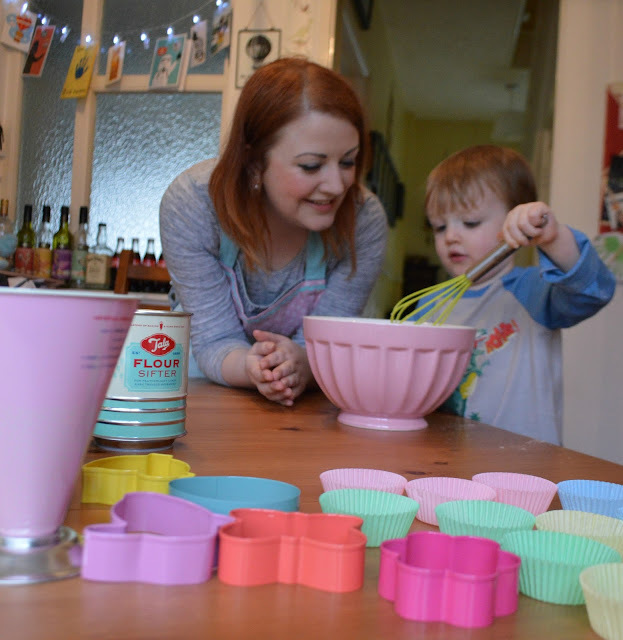 I also chose this pink ceramic mixing bowl, with beautiful painted flower detail, this wooden cookbook stand, which is just perfect (I've wanted one for ages), plus a few baking bits and pieces including some Tala bits of equipment. Along with my trusty Pyrex jug (which I've had for a looooong time! ), we were all set and ready to go. Just look at all those gorgeous, pastel colours. Exactly what was needed on such a drizzly and dreary Saturday. Ethan helped me measure out and mix together the ingredients. He was a bit impatient, wanting to do the next thing before we were ready, but that didn't matter and I was amazed at how good he was; he had real control over the utensils and was really excited to be doing it himself. 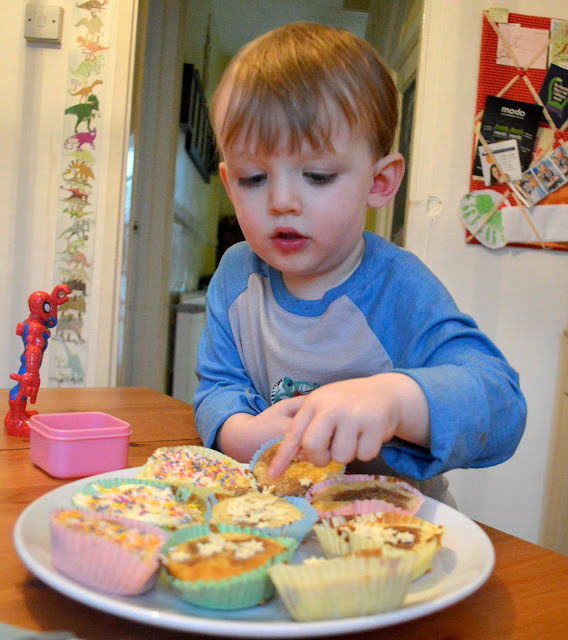 I had a lot of fun using my new kitchen bits and bobs, and Ethan made sure all the mixture got used up. This ceramic baking tray and cookie cutter set is absolutely beautiful and would make for the perfect Mother's Day gift - at just £15, it's a really thoughtful present, ideal for Spring and great to enjoy with your little ones. Or, your little ones could use it to make some treats for you on the day itself (that is, if they - or daddy - is extra organised!). Didn't you know, superheroes are brilliant bakers? We made marble cupcakes, the sloppier the better, and decorated a few with vanilla icing. And some also had some white chocolate star sprinkles - although we ended up eating most of those between us, before the could even get to the cakes! It was a lovely way to spend the afternoon and as a treat, Ethan showed me a magic trick of how he can make three cupcakes disappear, just like that. Sometimes, it really is the simple things in life. Some cake mix and a rainy afternoon. Mother's Day is just a month away and it was nice to have an early treat. This year will be my third proper Mother's Day - bean, as Ethan was known when he was in my belly, sent me some flowers and a teddy three years ago before he was born - and I can't wait. The most important thing is to spend time with my little man, of course, but having a special day that's about our relationship, and having a nice card and maybe a little gift is also rather nice too. Ethan has spoilt me in the past (I don't know where he gets his pocket money from) just as I like to spoil my mum. 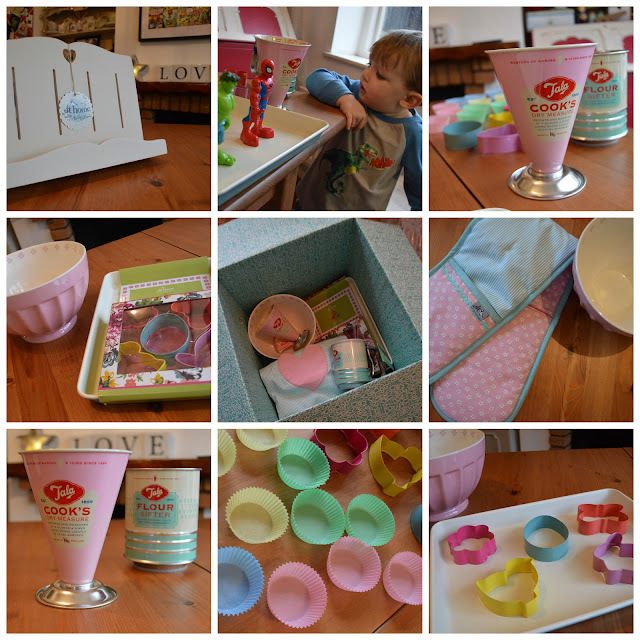 From my new bundle of treats, it's clear that Debenhams has some great Mother's Day gift ideas (like my pinny or cookie cutter set) and there's no harm in starting shopping early. Occasions like this always come around quickly, don't they? So, don't forget, Mother's Day is Sunday 6th March. And whatever you're planning, be it baking or just spending time with your buddy, enjoy every moment because you deserve it. And cake. You always deserve cake. Lovely photos - it's great getting children to bake with you. Mine gets bored halfway through and only appears again to ask if things are ready. Thanks Emma! It is hard to keep them interested or at least do what they need to do. The end result didn't last very long either! It's a simple thing isn't it, but I think because there's mess involved, and something to eat too, most children like it! And thank you for the kind comments - the new bits and pieces have brightened up our kitchen and the photos are from our dining room - we had to do it all on the dining table because there just wouldn't have been a lot of space in the kitchen. I agree - it doesn't matter about the mess, and it's so easy too.